Showing 4 articles from December 21, 2014. If you are out on the road along Hwy. 101 traveling out of Raymond heading toward Aberdeen, you may want to be careful with the sighting of elk just a half-mile out of town. Ronny Johnson of South Bend gets a turn to sit and whisper his wishes for Christmas to Santa during the Lighted Boat Parade held in South Bend last Friday. 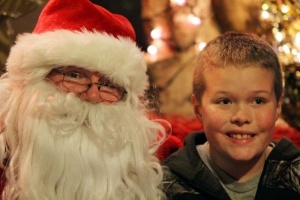 SOUTH BEND - For the youth of South Bend and the surrounding areas, Santa arrived in town this past Friday Night. Officer Deko is the latest addition to the Raymond Police Department, but he is the type of officer that could work for table scraps and a scratch behind the ear. The Willapa Players have selected their winter show for the 2014-2015 season. Play On! by Rick Abbot was submitted by director Dave Lund and approved at the December board meeting.